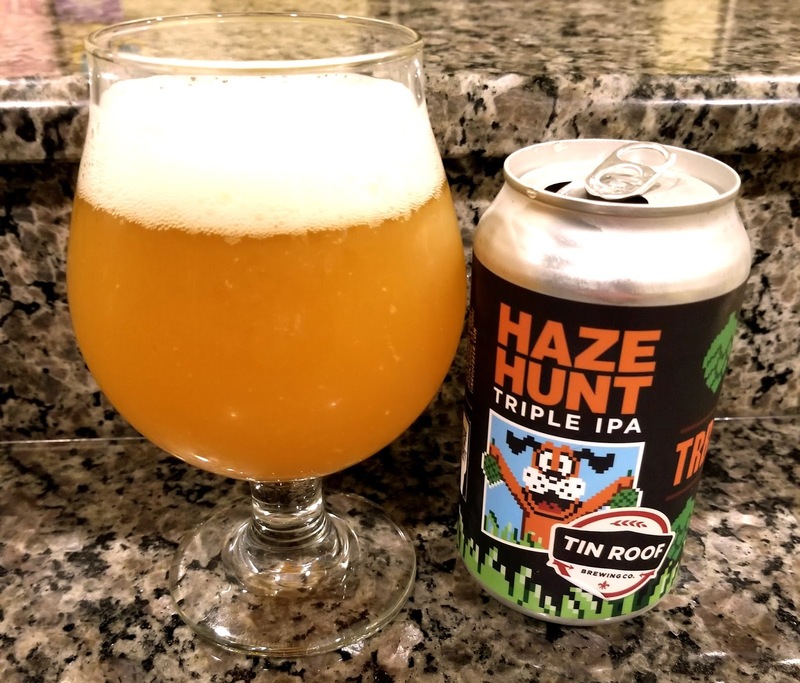 I know, I know, two straight Feature Beer Friday posts featuring local brewery Tin Roof Brewing, but this also makes two straight weeks that Tin Roof has released a beer worthy of receiving some attention. Last week's post featured the new Juju Imperial IPA and one week later they upped the ante with a similar (albeit noticeably different, which I'll elaborate on later) Triple IPA themed after the old Duck Hunt game from the original Nintendo system. Before I even get into the beer, I have to congratulate Tin Roof on putting together a great release day. I had a pretty busy weekend and wasn't able to get to the brewery early for any pre-gaming, only barely managing to show up as doors opened at noon, only to see a line going down the front steps, across the front of the building, and turning toward the street. I'm guessing somewhere between 75-100 people were already waiting to get in and buy their 4-packs, teku glasses, and shirts. I wasn't too worried about the merchandise line, as I have amassed an overflowing glassware collection as it is, so I went through the side door and got a pour of the new beer. Juju ended up 10.5% abv while the Haze Hunt finished at 11.2%, so even though one was labeled an Imperial IPA and the latter a Triple IPA, the alcohol content was really close together. There's really no standard definition for a Triple IPA, so some breweries just label anything stronger than their Double (or Imperial) IPA as a Triple. Other breweries try go get over 12% before they put that Triple label, and some only aim for over 10%. As of now, it's not an officially recognized style, but my understanding is that the powers that be are considering adding a Triple IPA in the next edition of the style guidelines... but that's enough beer nerd talk, right? My first thought was that the Haze Hunt has a little more orange on the color, but still fairly light and definitely still hazy like the Juju. The aroma is strong with tropical fruit flavors like passionfruit and pineapple, with nary a trace of the booziness underneath. The taste is bitter but bursting with mango and pineapple with a hint of dankness and a smooth finish. The Haze Hunt doesn't quite have the velvety smooth finish of the Juju, but it's still extremely pleasant and kept me coming back for more. 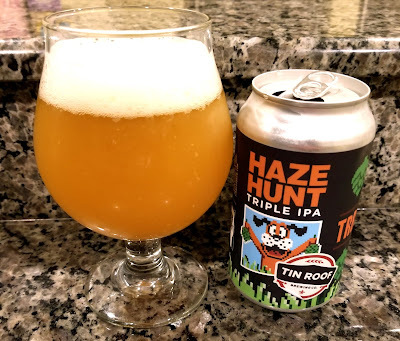 This is two extremely exiting and well done beers in a row for Tin Roof, and it's awesome to see our local brewery get this sort of hype. I am confident the winning ways are doing to continue over there by downtown for the foreseeable future!